My all-time most-viewed blog post wasn’t the parable about beer and the tax system. Nor was it the joke about California, Texas, and the Coyote. Those won the silver and bronze trophies. The gold medal belongs to the two pictures that explain how the welfare state begins and how it ends. Those images make a very serious point that the social capital of a nation gets eroded and the economy gets overburdened when there are too many people riding in the wagon and not enough people pulling the wagon. And I’ve been especially fond of the wagon cartoons because they were my idea. Unfortunately, I can no longer claim to be the first one to explain this relationship using humor. I’m currently in Copenhagen, where I just gave a speech on the collapse of the welfare state at the Center for Politiske Studier (CEPOS). While at the CEPOS offices, I noticed a big print hanging on the wall and it was eerily familiar. One of Denmark’s main newspapers put together this cartoon, based on CEPOS research, about the growing share of the population living off the state. 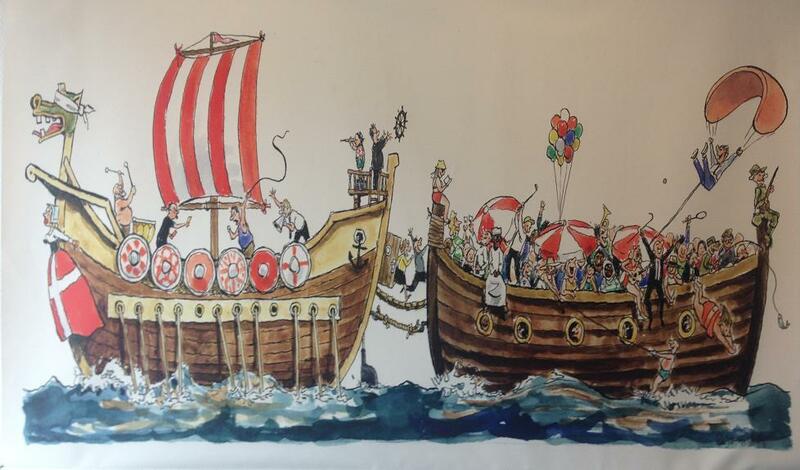 It shows a boat of galley slaves (i.e., taxpayers) towing a party boat filled with people (like the infamous Lazy Robert) who live off the state. Since Denmark has a very large burden of government spending, you won’t be surprised to learn that the dependency class is a huge chunk of the population. Here’s a table from the CEPOS study. You don’t to be fluent in Danish to get the message. The first line is the number of government bureaucrats (and they’re really expensive in Denmark). The second line is the number of people getting transfers. Those categories are then added together on line 3 and compared to the adult population on line 4. The key takeaway is that two-thirds of the population is riding in the wagon! No wonder the burden of government spending is enormous and tax rates are so high. It’s so bad that I even joked that birthers should accuse Obama of being born in Denmark. But at least the Danes have a sense of humor. 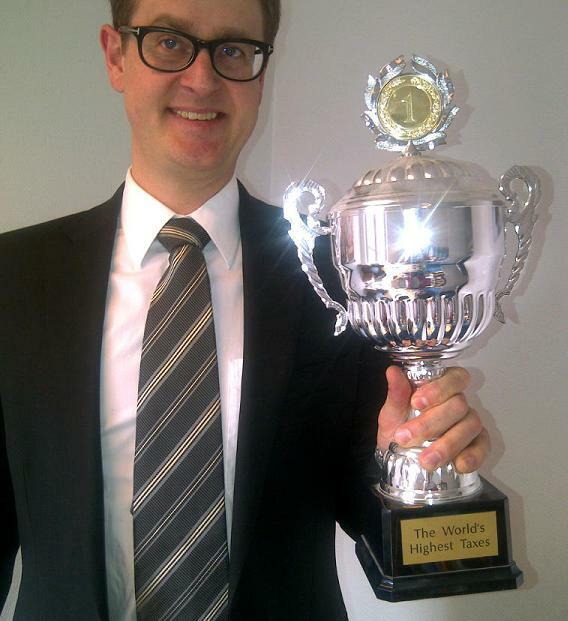 Here’s Mads Lundby Hansen, one my friends at CEPOS, holding the “trophy” they received from the Swedish Taxpayers Association. Not exactly the prize a nation should want to win. Though it’s worth noting that Denmark actually does better than the United States in the Economic Freedom of the World rankings. Their welfare state is bigger than ours, so they get a bad score on fiscal policy. But they are more pro-capitalism in other areas and their overall grade is higher. What kind of idiot would prefer not to travel in the party boat?? Well, I suppose that the tow boat needs to be operated by competent crew, and some types of work are fun. It so happens that I know a thing or two about sailing and playing music. (Really and truly, I do.) So, to whom should I send my resume?